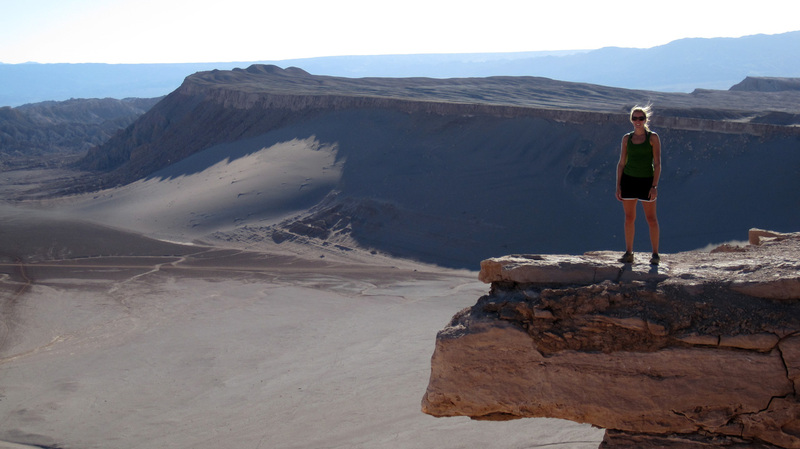 The striking Atacama desert of Chile. We are happy to announce that we have finally made our way to Argentina! We say this with enthusiasm and relief because it has been sort of an arduous journey. We were scheduled to fly out of Quito and land in Buenos Aires on February 19th – very simple and easy. However, we managed to seriously complicate matters when we missed that flight because we fell asleep a few hours before our 9:45 pm departure (due to our exhaustion from climbing Cotopaxi that morning) and didn’t set an alarm. We woke up 30 minutes before our plane took off, and of course by the time we got to the airport it was too late. The worst part was that we couldn’t find another flight to BA until March 8th! So after pleading with the airline and weighing the pros and cons of waiting vs. busing it down, we found a way out by flying to Lima, Peru instead – still a very long way from our intended destination, but a bit closer nonetheless. So thanks to our new travel alarm clock purchased in Quito, we woke up on time on the morning of February 21st to catch our flight to Lima. Needless to say what we were looking forward to as a relatively short, painless flight skipping over thousands of miles of terrain to the dynamic, first-world city of Buenos Aires, became a series of 8+ hour bus trips, with a few nights of rest here and there, slowly making our way south through arid and barren land. We didn’t feel bad quickly passing over Peru, since we plan on being back in May. 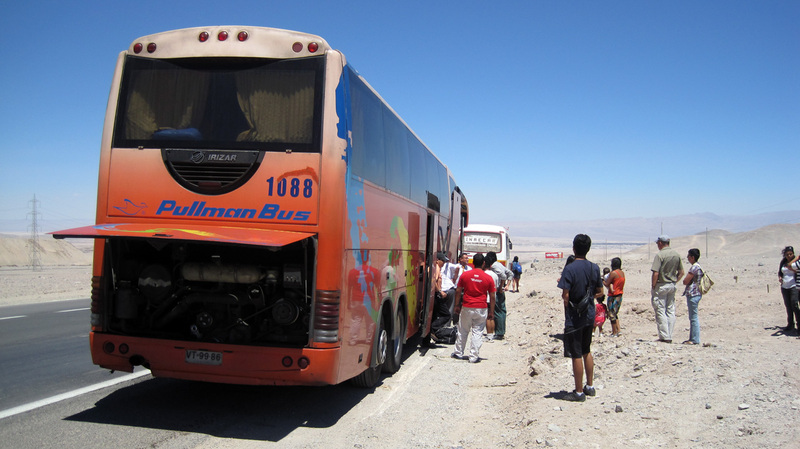 The good news is that we found that the buses in Peru were considerably better than Ecuador. We boarded Cruz del Sur – a pretty swank bus with seats that recline far back, food and refreshments at no extra charge, air conditioning and on-board entertainment. The bus attendant actually came up to us and asked if the volume and temperature were to our liking. Wow. 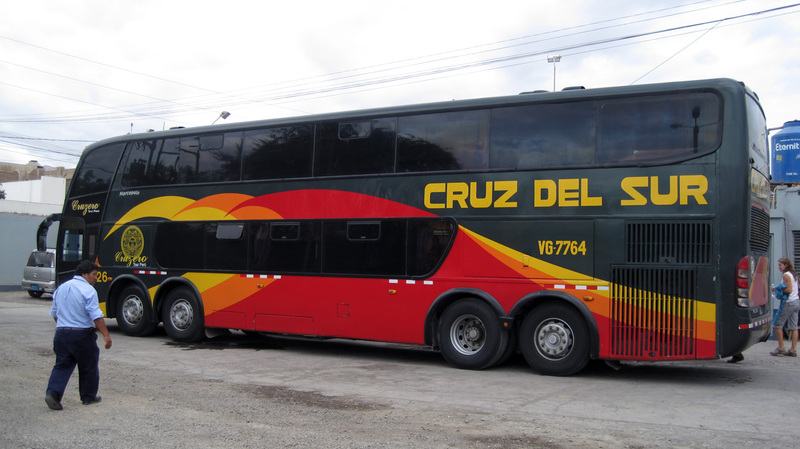 Our first upper class bus – Cruz del Sur. They serve food and drinks! 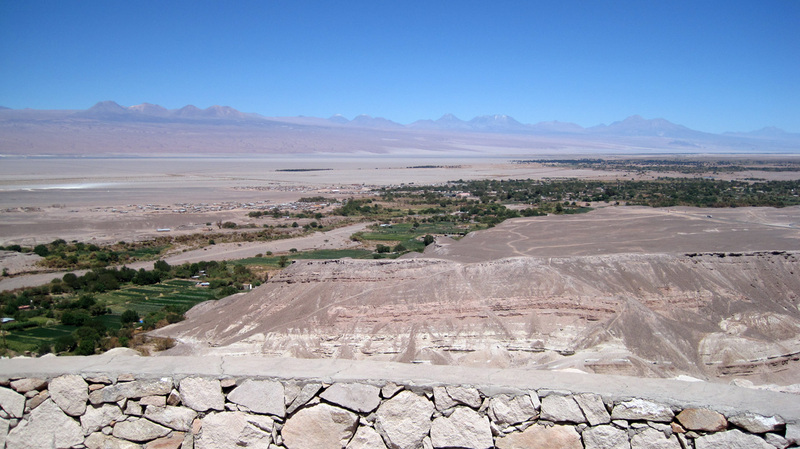 Our first stop was Nazca, famous for the Nazca lines, a series of ancient and large geoglyphs that are best seen and appreciated from above. Although we opted out of the scenic flight (a bit pricey, plus there was a crash recently), we enjoyed spending time in our very nice hotel and even catching a glimpse of the Olympics on tv! Back on the bus, we made our way down to Arequipa, a charming colonial city and the second biggest after Lima. Although we’re not huge fans of cities, we did enjoy a day strolling through the “White City” – as most buildings are made out of a white volcanic rock. 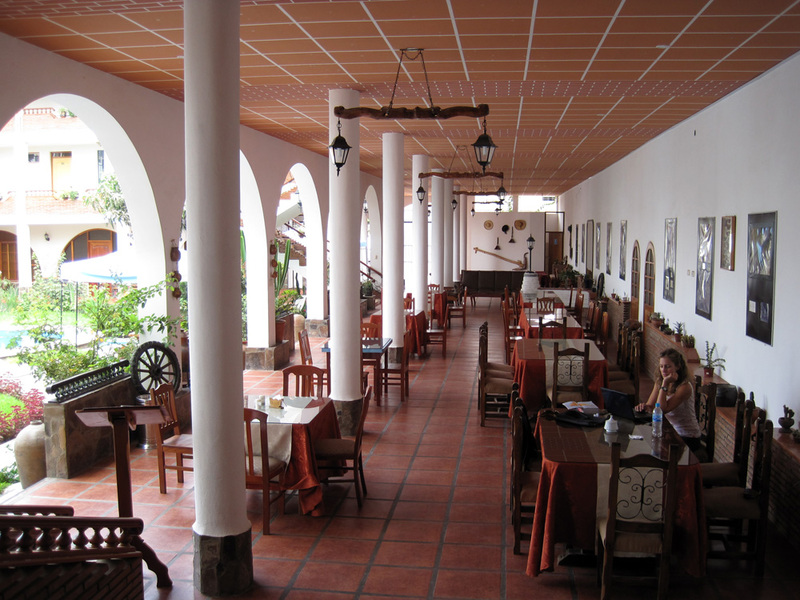 We dined on a terrace overlooking the plaza and ate delicious Peruvian food while our waiter decided to practice his English on us and rambled about a religious epiphany he had that day – a bit of an intrusive, but friendly fellow. Our surprisingly plush hotel in Nazca, Peru. The pool is necessary in desert country. 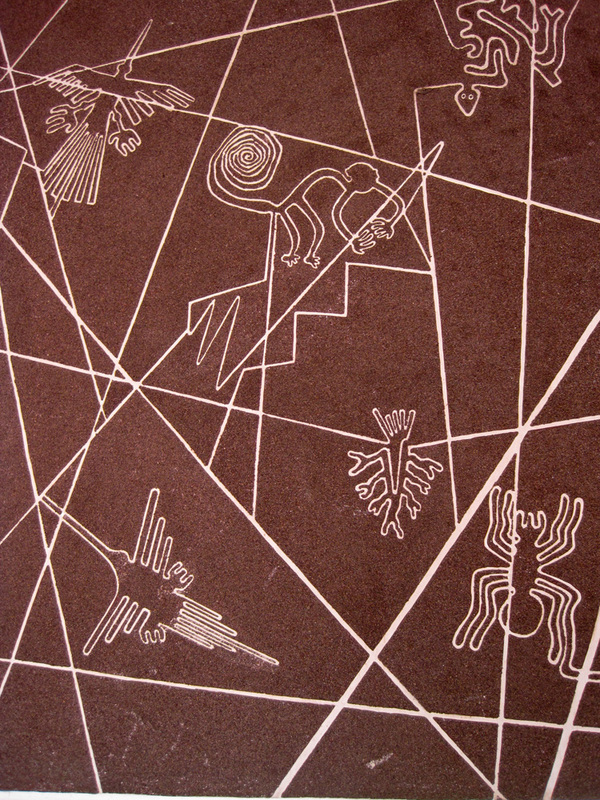 The Nazca lines as would be seen from above – but perhaps a tad bit smaller and clearer. 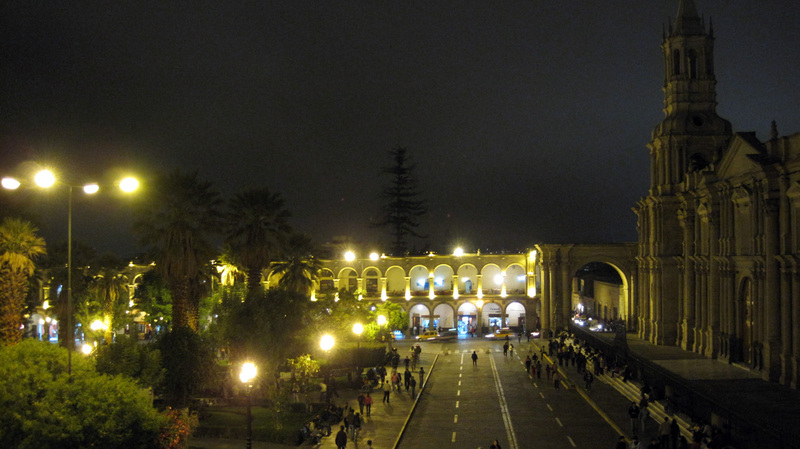 The colonial-style plaza at night in Arequipa. 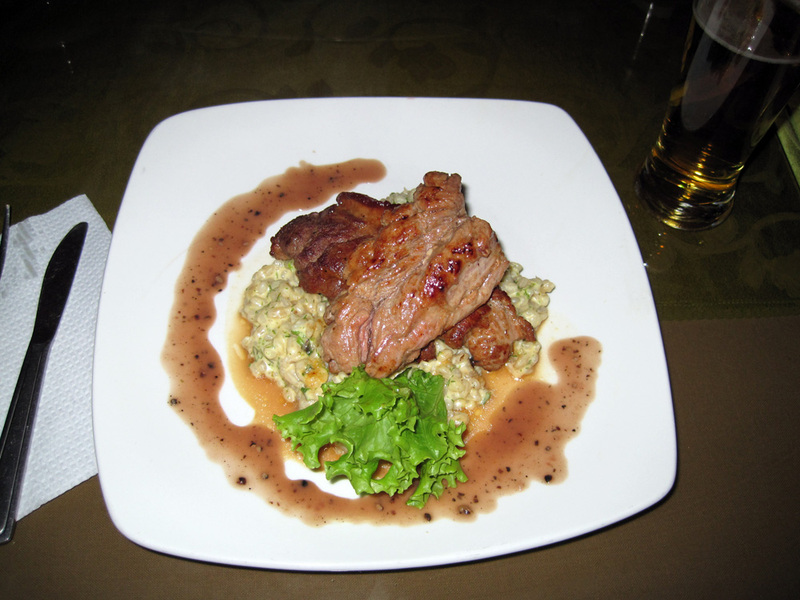 Pat’s alpaca steak over a bed of risotto – new age Peruvian food. Next, we made our way southeast to Puno, a small city on the coast of Lake Titicaca, which borders Bolivia. 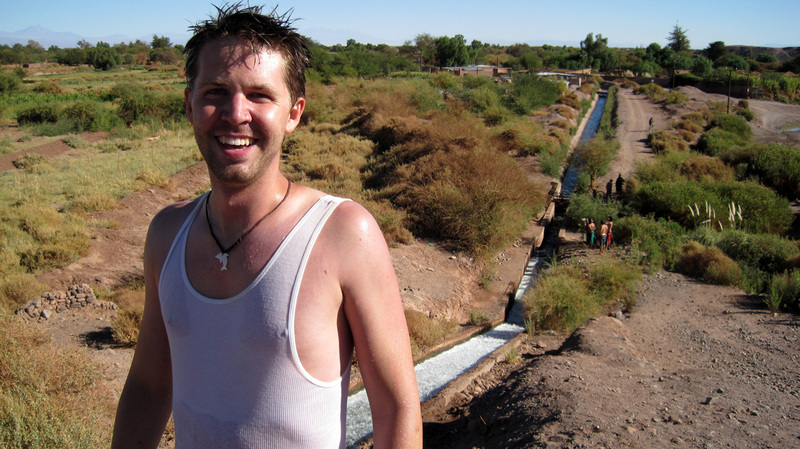 We had planned on crossing the border into Bolivia the next day. However that morning, we went online to verify entry requirements for US citizens and realized that we had to pay a hefty $130 “reciprocity fee” each. The US charges Bolivians that much for entering the country, so they do the same for us. Not wanting to spend that much money for nothing, we mostly planned to use Bolivia as a transit country on our way to Argentina, we changed our plans and decided to head south towards Chile. 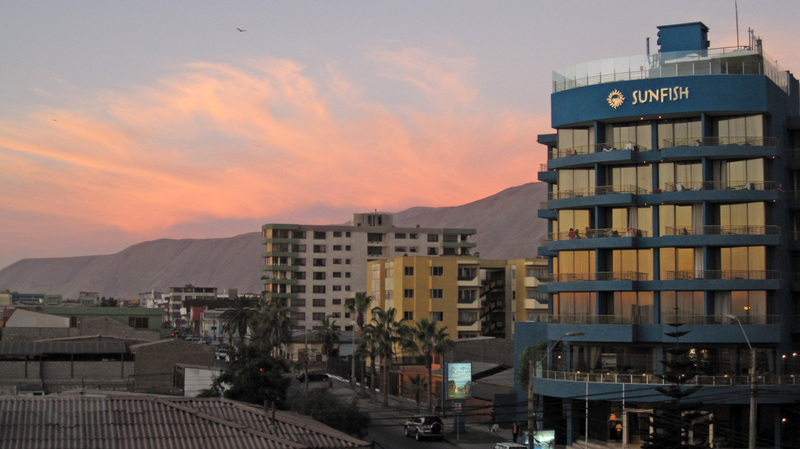 After 21 hours on a series of buses, one of which was cockroach-infested, had passengers smoking and no ventilation whatsoever, we arrived at our destination in Chile and were greeted with the beautiful beach city of Iquique. For the first time in about week, we were finally able to breathe easy, relax and enjoy where we were. 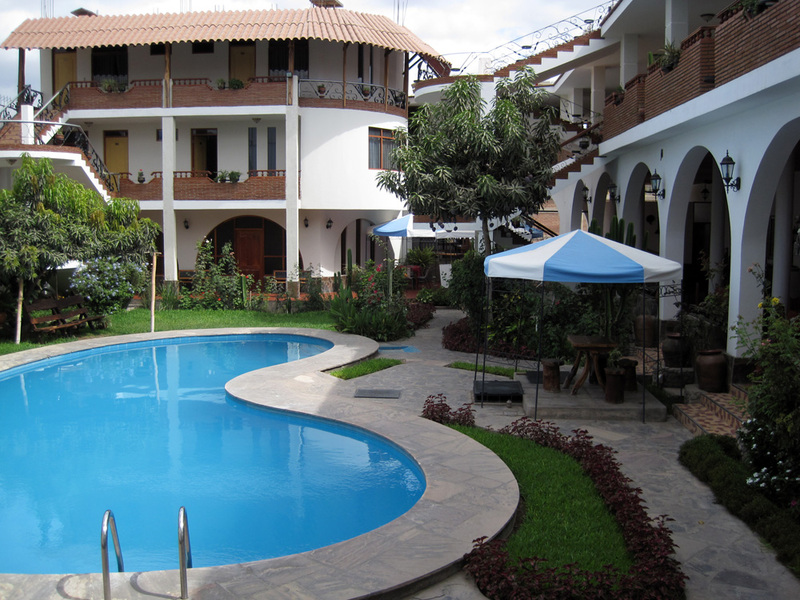 Our hostel was clean and friendly and only a 2-minute walk from the beach. We lounged on the beach, went running on the boardwalk, shopped in a real grocery store and went out for delicious sushi one night. Chile is significantly more developed than its northern neighbors – enough that we instantly felt safer, which is kind of ironic since it was the exact same time when the earthquakes hit down south. Thankfully, we didn’t feel any side effects from that disaster and were able to enjoy the beach without the threat of a tsunami. 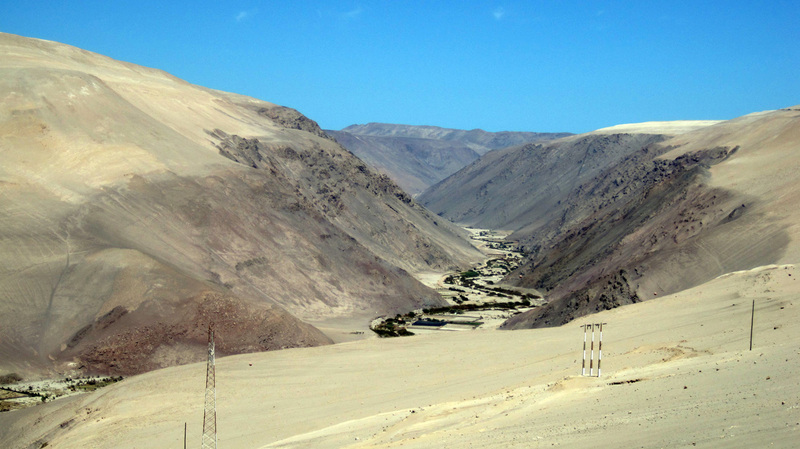 The Chilean desert on the way to Iquique. 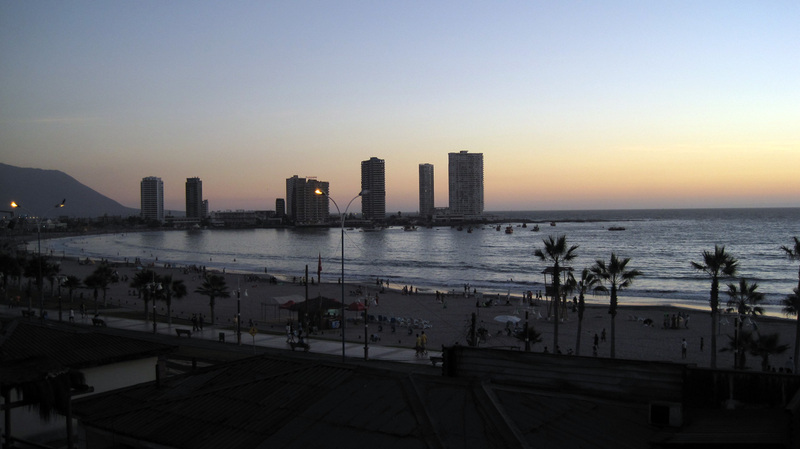 Iquique was a welcome beach haven after 21 hours on buses. We had delicious sushi on the rooftop of the Sunfish hotel. 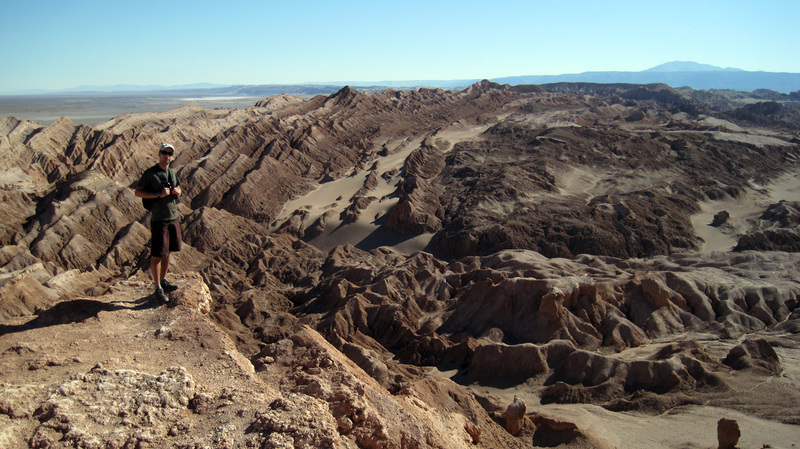 Next we ventured southeast to San Pedro de Atacama, a true oasis in the middle of the Atacama desert. On the way there, our bus broke down, which wasn’t so bad, since they were playing the fourth Bruce Willis movie in a row, and we were happy to hop onto another bus only 30 minutes later. San Pedro is a cute, small town with lots of organic restaurants and simple and comfortable lodging, albeit pricey. 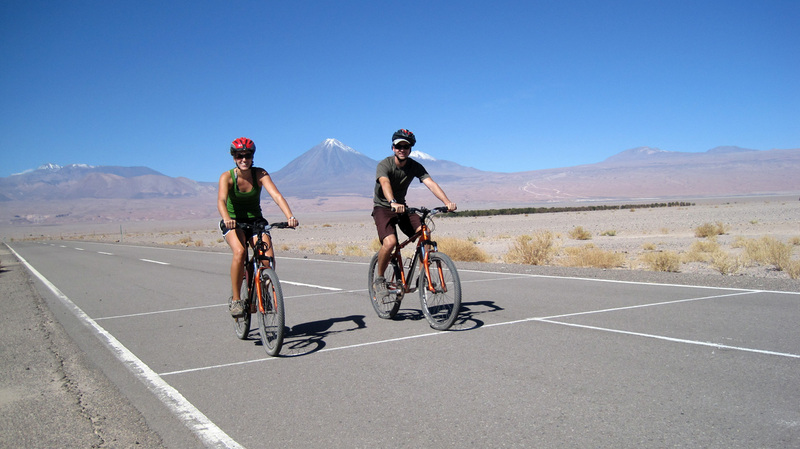 The town also offered countless tours to nearby salt flats, clear-blue lagoons, geysers, sand boarding dunes, etc., all of which was too expensive for us, so instead we rented bikes and explored the area on our own. As I was feeling under the weather on the first day, Pat went for a ride with a couple friends from the hostel to hike in a nearby park and ride through a cool canyon. 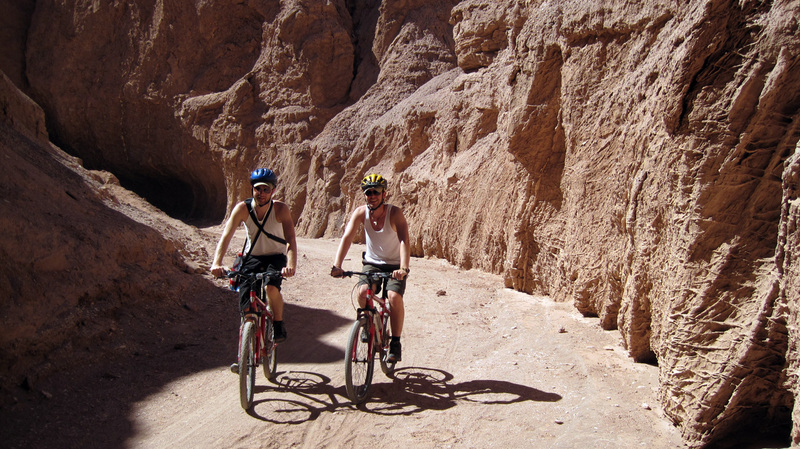 Together the next day, we took off on bikes in late afternoon and climbed up to the view point of Valle de la Luna (Valley of the Moon). The views were exactly what you would image the moon to look like. It was so quiet and peaceful up there, and all the more rewarding after a long uphill climb. Our bus broke down from Iqique to San Pedro - probably from climbing hills in the desert. 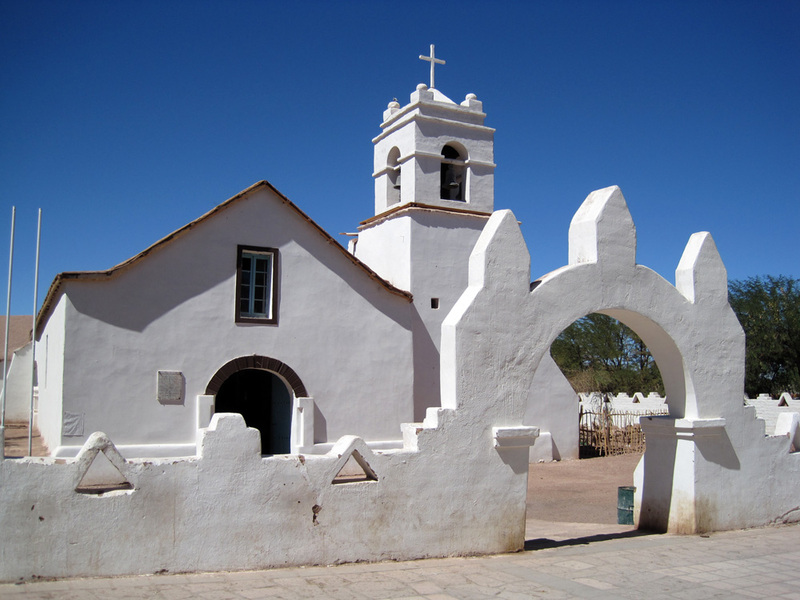 The charming cathedral of San Pedro de Atacama. 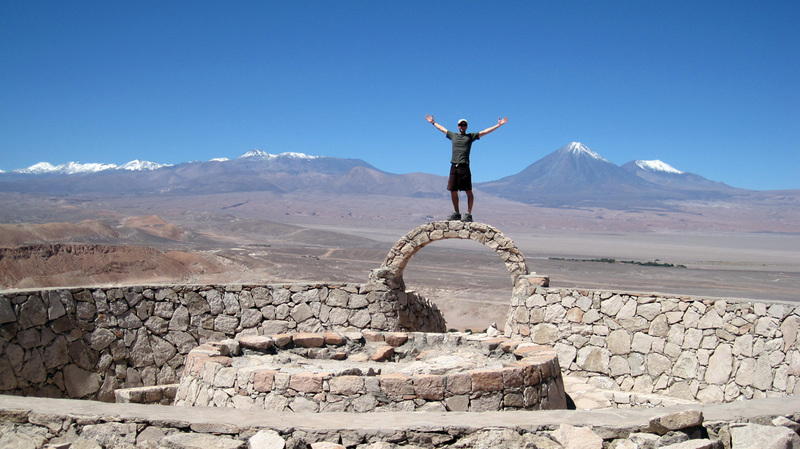 San Pedro de Atacama – an oasis in the middle of the desert. 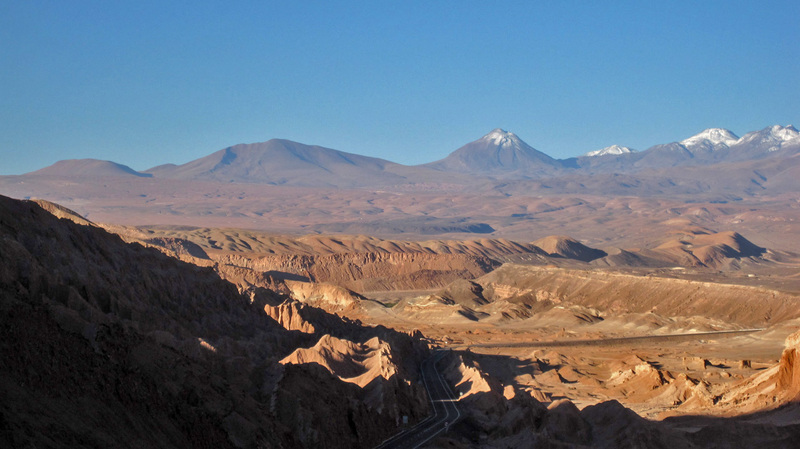 Astonishing snow-capped mountains on the edge of the Atacama desert. 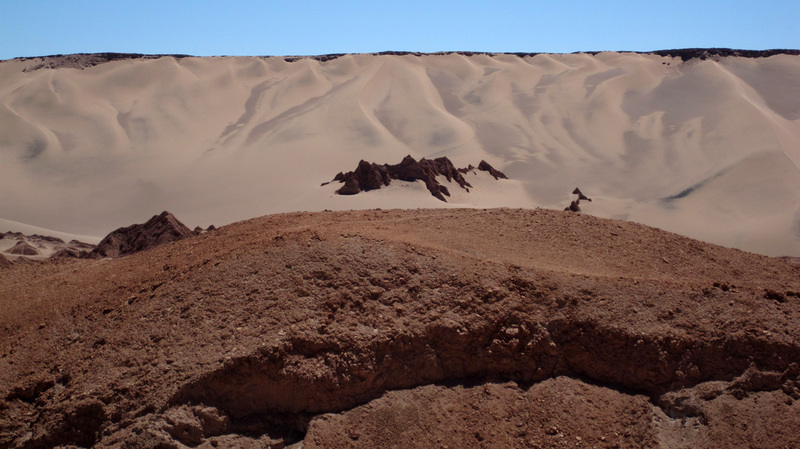 Valle de la Muerta – perfect dunes for sand boarding. Pat went on a bike ride with a couple friends from our hostel, Micheal (Swiss) and Dan (US). 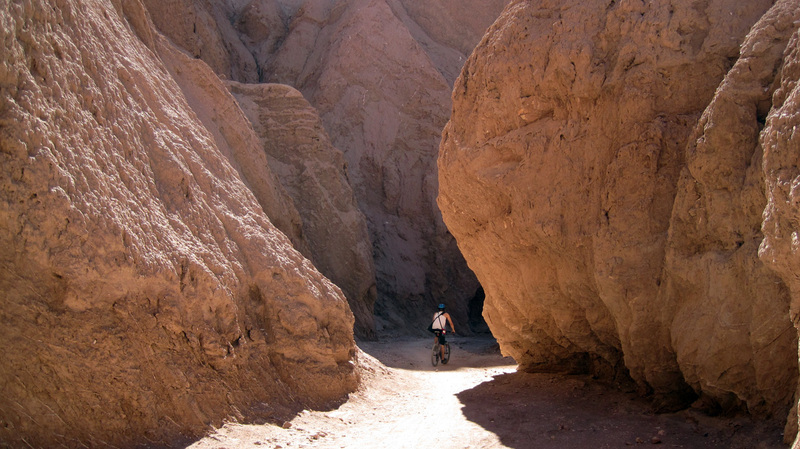 Fun trails through the narrow Quebrada del Diablo (Devil's Canyon). Dan climbs up for another run down the "municipal water slide" at the reservoir outside San Pedro. Another day of biking –it started out flat, but that didn’t last long. 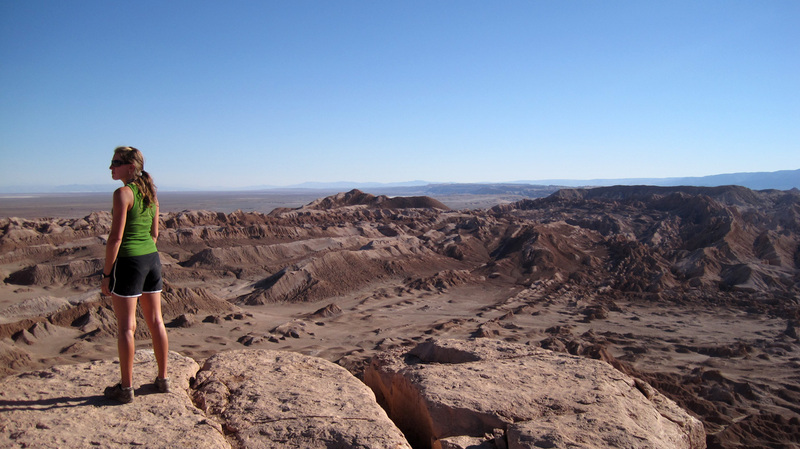 The jagged terrain of Valle de la Luna – valley of the moon. Overlooking moon-like craters and valleys. The next morning we boarded yet another bus to brave our 8th border crossing of the trip, finally reaching Argentina! Since the Andes act as a natural border between both countries, the bus slowly made its way up and down the switchbacks of Paso de Jama, passing one terrible truck accident and heaps of small memorials set up alongside the road to honor those who didn’t make it. It was a little unnerving, but our driver was cautious and anyway we were enamored with the scenery. It was definitely one of the most beautiful roads we’ve taken so far, passing salt flats, shallow lagoons with flamingos, heaps of vicunas and alpacas, and dramatic peaks. As we crossed over to Argentina and descended into the valley, the climate changed drastically from brown to green. 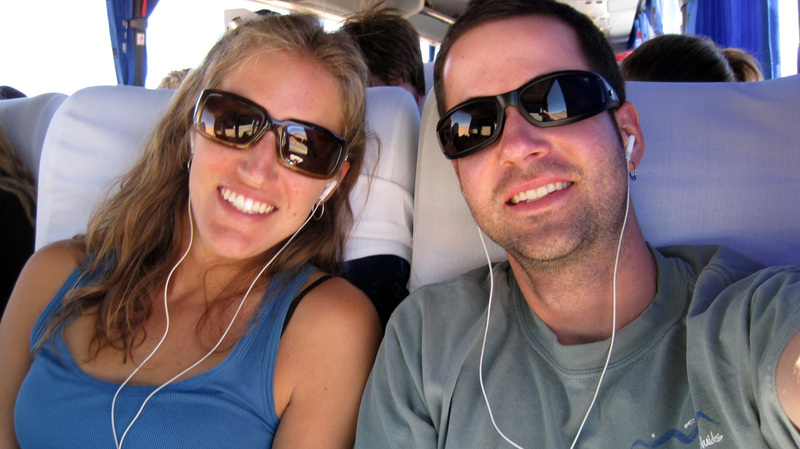 At the end of 10-hour bus trip, we reached the city of Salta in Argentina and had our first taste of the country. We ordered a good but inexpensive bottle of wine, drank the whole thing, and didn’t even have a hang over the next morning. Now that’s pretty amazing. Enjoying the panoramic views in seats 1 an 2. 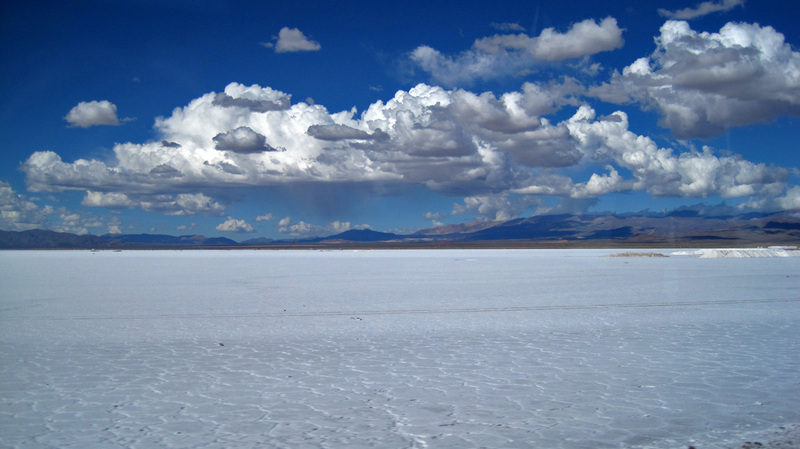 The stark while salt flats along the Paso de Jama. 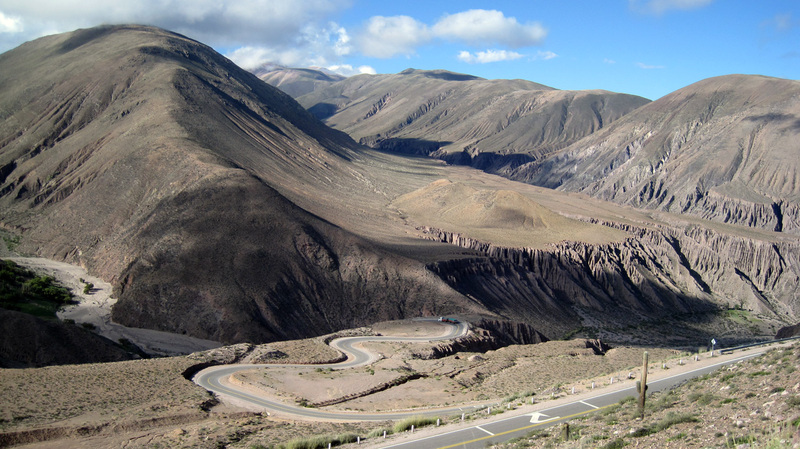 The steep switchbacks coming down into Argentina. See you guys in few days, in Patagonia! WOW; What a nice trip !!!!!!!!! Enjoy !!!!! I have been following your adventure from the beginning. It far surpasses the cliche “An Excellent Adventure”. It is like describing the Grand Canyon as…grand. Excellent doesn’t begin to encompass your trip of a lifetime. Ed and I just returned from Costa Rica and were at Arneal Volcano, Playa Hermosa and Liberia. Costa Rican roads have to be the worst…but I bet you have found many that are comparable and worst. Love your blog!